Featured image from the gallery at TRAPPIST-1. 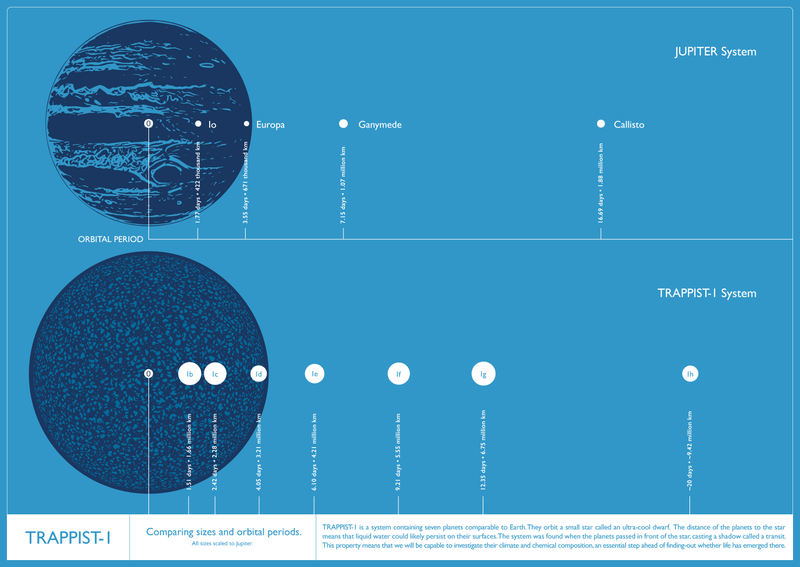 This image compares Jupiter and its four largest moons to TRAPPIST-1 and its planets. All sizes have been scaled to Jupiter. In 1975, Viking 1 and Viking 2 were sent to explore Mars. Before they were launched, both probes were baked at 112 degrees Celsius for about 30 hours. This was not a test of their hardiness; NASA was guarding against Mars being invaded by terrestrial lifeforms. Over forty years later, the risks of contamination by space exploration are still being debated. One argument against excessive precaution is that if life from Earth could infest other planets or moons, it would have already done so by piggybacking on interplanetary debris. Last February, astronomers confirmed a system of seven Earth-like planets orbiting the star TRAPPIST-1 (see this astrobite for details). Besides the number of planets it hosts, TRAPPIST-1 is especially interesting because it’s awfully close (12 parsecs away to be specific) and because three of its planets — TRAPPIST-1e, f, and g — lie in the star’s habitable zone (HZ). The TRAPPIST-1 HZ planets are much closer to each other than the Earth is to Mars, prompting the authors of this paper to wonder — if life could survive in the TRAPPIST-1 system, what’s the likelihood of life spreading from one planet to the next? Figure 1: The model for lithopanspermia formulated in this paper. Pxy is the fraction of ejected rocks from X that will impact Planet Y. ay denotes the semimajor axis of Planet Y’s orbit, My and M∗ denote the masses of Planet Y and the host star respectively, and Dxy denotes the distance between the planets. ηxy is a catchall factor to describe any subtleties and influences. 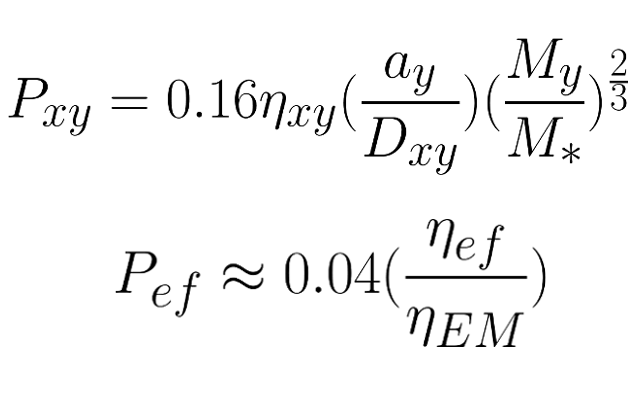 ηEM (η for the Earth-Mars system) can range from 20 to 270. ηef (η for the TRAPPIST-1e and f) cannot be constrained as of now. Panspermia is the hitch-hiking of life or the building blocks of life from place to place. When rocks are involved, the term becomes lithopanspermia. In this paper, the authors consider how likely it is for life to evolve around TRAPPIST-1 by formulating a simple model for lithopanspermia in the system. While no direct evidence of lithopanspermia has been observed in the Solar System, it is feasible for microorganisms to survive extreme trips between planets. Beginning with assumptions from classical mechanics, the authors derive an expression for the fraction of rocks ejected from Planet X that will hit Planet Y, Pxy (see Figure 1). They also specify a transit or travel time τxy that depends on the rocks’ velocity and the distance between the planets. A shorter transit time implies a greater chance of survival for any tagalongs. To give context to the TRAPPIST-1 values, the authors use Earth and Mars as standards. The authors found that the proximity of the TRAPPIST-1 planets to each other made them more likely to experience successful lithopanspermia events than the Earth and Mars would. This factors into a higher probability of abiogenesis, or the rise of life, in the TRAPPIST-1 system. 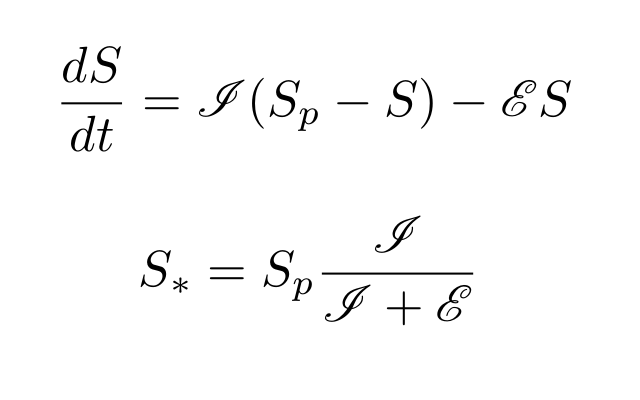 Figure 2: Equations for species diversity S and equilibrium species diversity S∗. Sp is the total number of species that can migrate from the source, and I and E denote immigration and extinction rates, respectively. To evaluate the diversity of possible life in the system, the authors treat the TRAPPIST-1 HZ planets like islands in a sea — isolated and pristine until newcomers from the mainland arrive. This allows for theoretical ecology to be used to make qualitative arguments on whether life will thrive around TRAPPIST-1. The rates of “immigration” I and “extinction” E depend on the size of the island, its proximity to the source of immigration, and the size of the source itself. I and E are used to define the species diversity S and the equilibrium species diversity S∗ (see Figure 2). In addition to being in close proximity to one another, the TRAPPIST-1 planets are all roughly Earth-sized. This suggests that any species stranded on a TRAPPIST-1 planet would be less prone to extinction than a species on Mars because of the available surface area. If life is possible in the TRAPPIST-1 system then panspermia is highly likely. Detecting the same biosignatures on multiple planets would distinguish between incidences of life being seeded on a planet or rising on its own. The useful biosignatures would be i) gases such as oxygen, and sulphur compounds, ii) the “red edge” (see this astrobite) or the observed red peak in light reflected by plants, and iii) the presence of amino acids and sugars that are the building blocks of life. In short, TRAPPIST-1 seems far more likely to have life on multiple planets than the Solar System does — provided that planets e, f, and g are amenable to life, and that any organisms in the system could survive the violent ejection and journey associated with panspermia. Although the authors focused on the TRAPPIST-1 system in this paper, their results can be extended to planets orbiting M-dwarfs and even exomoons. So while hitchhiking about the galaxy still seems like a far-off dream, some lucky microorganisms might be able to catch an interplanetary ride. I'm a second year graduate student at Texas A&M University. Currently I'm looking for Mira variables to better calibrate the distance ladder. I'm also looking for somewhere to hide my excess yarn (I'm told I may have a problem). Nice choice of the image of the TRAPPIST-1 system there!